Charlie Sheen admitted his HIV-positive status to Matt Lauer in mid-November, partially in order to get ahead of a National Enquirer story, but also to stop the stream of people he said were blackmailing him over the information. Sheen had been gossiped about before that piece was released, most notably in an “exclusive” article on Radar Online published a few weeks before entitled “Hollywood Superstar’s Desperate Battle With AIDS Revealed.” But now, Sheen has spoken to the very publication that forced his personal information out into the public about his goals for the future. In the conversation, Sheen says he’s speaking to Radar and the National Enquirer (that piece we can presume is forthcoming; it’s likely just a print version of the Radar interview) in order to share his story specifically with their audience. I am in a rare position to turn my diagnosis into a positive, and that began with telling my truth to Matt Lauer, and now I’m talking to you and The National ENQUIRER so that I can reach your audience with my story and continue to shine a light on this disease while brilliant scientists continue to search for a cure. “Perhaps in my research, and in my journey, we can help develop ways that make it affordable for all,” he tells Howard. If anybody can fight this thing and discover a cure, it’s me. I will exhaust every resource available to me. I will sit with every expert. I will move forward until something’s revealed. 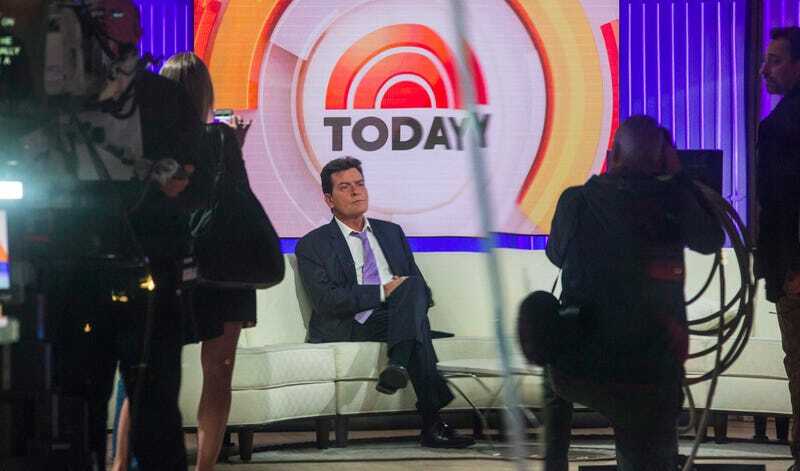 It is noteworthy that Sheen—after sharing his news with the more reputable and celeb-friendly source The Today Show—has returned to the sleazier tabloid publications that helped force his hand. But he seems to be suggesting that they helped him, in some sense; he reiterated to Radar, as he suggested to Lauer, that he feels a “weight” has been lifted. It’s not as if all his troubles are gone, though; Sheen’s ex-girlfriend Brett Rossi has sued him for allegedly forcing her to get an abortion because he didn’t want “to give birth to a retarded child. “I want to break the next John Edwards story,” Howard told Politico Media last year. It looks like he did.